When I started working for myself fulltime, I was so excited for the freedom and flexibility I could have. No rules, no restrictions, no routines. I could do whatever I wanted, when I wanted and no one could tell me otherwise. But it didn't take me long before I realised I was a little lost and not getting anything done. I'd spend several days vegging out on the couch and then have to stay up until 3am to meet a deadline. Then I'd sleep until midday the next day and the whole cycle would start all over again. So I decided to implement a routine. It took me a couple of goes and over 6 months but I eventually made progress with this, and I found that instead of feeling restricted because of it, I felt better than when I'd just been doing whatever I felt like. My grandparents have been retired for as long as I can remember, and they've got their own little routine that they go through day by day. My grandma gets up usually before the sun, grabs something to nibble on (she's diabetic and manages her sugar levels pretty well), potters around a bit, flicks the kettle down then goes back to bed to read for a bit. After a while my grandad will start to stir and she'll get up to make the coffee and bring that back in to bed for a bit longer before she gets up and starts breakfast. Although it flexes and flows, their routine will usually stay the same day to day, to the point where my grandad will often turn up for dinner at our place in his ugg boots because he's already had a shower and doesn't want to have to put real shoes on again. But their routine doesn't mean they can't do what they want, it's flexible. I'll often call home and find out they've gone to the beach for the weekend and earlier this year they came to visit me for a week. While they stayed with me, I was woken up early in the morning by the sounds of my grandma pottering around in the kitchen, she'd find something to eat, grab one of my books and head to bed to read for a bit. Even though they were on the other side of the country and "on holiday" (can you be on holiday if you're retired? ), they still had their routine, not because they had to, but because their routine is one they've chosen and one that works for them. Breakfast took a little longer than usual (we're a big breakfast family and when we get together it can sometimes be an event that takes a couple of hours), but they know what works best for them. 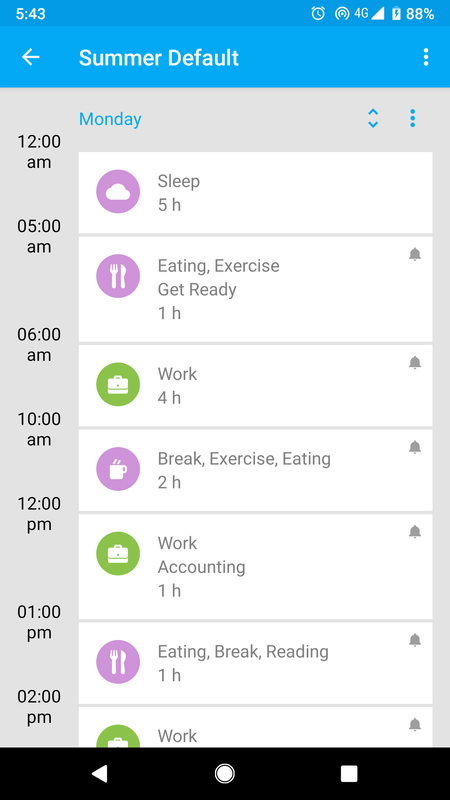 Since I didn't have set working hours to take into account, I've spent the past year finding a routine that works well for me. I'm very much a morning person and this is my most productive time, so my day starts pretty early. Depending on the season (everything gets pushed back an hour in winter because I'm really not a fan of getting up when it's cold and dark outside), my day starts at 5am. Growing up in Queensland, the day gets light and hot very early in summer, so I've had a lifetime of starting as early as I can before it starts to get unbearable. Each morning I have an hour to get ready, which includes taking my dog for a quick run (pending rain, we both decide to bail when it's miserable outside), have a big breakfast and be at my desk around 6am. I get straight into my work, tacking the most difficult and thought intensive tasks first while my brain is working at it's best. If I don't have any distractions, I can usually smash out a heap of work during the next 4 hours and get a fair chunk of my work out of the way. Depending on the tasks I'm working on and how my concentration levels are going, I take a break around 10am and step away from the computer. One of the things I love about working for myself and summer means during this time I can go to the beach. I'm only about 5min from the beach at the moment which means I can make this a quick trip and it's great to get outside for half an hour, get some sun and my dog gets to have a swim and his main form of exercise for the day. During winter this is replaced with a walk at the park or just spending some time away from the computer, and because I start so early, I take a 2 hour break if I started at 5am, or 1 hour if I was up a bit later. For the most part, my admin work doesn't require much thinking, it's just something that has a tendency to get out of control and so I need to keep on top of it. Previously I've started answering one email and all of a sudden it's 3pm and I've gotten nothing done except for my emails, so I've started timeboxing things. For an hour during the middle of the day, I do my accounting, answer emails and do my various admin tasks like schedule in my social marketing or write blog posts. This is a time of the day when I'm not really at my best, and for these tasks I don't need to be so this is a great time to do them. It took a while to get used to not answering emails as soon as they came in, but by doing it this way I found it was much more efficient and none of my clients have had an issues with it. Unfortunately I can't completely switch off on the emails, so keep an eye on them throughout the day, just a quick glance to see if there's anything urgent or if it can wait until I'm next on emails. It's worth mentioning that I do have something to eat earlier in the day, and although I'm usually snacking and don't have big meals, there's something about lunch that always manages to bring on a food coma, full belly sleepy feeling (maybe it's because I've just been doing emails). So rather than fighting through and getting barely anything done after lunch, I schedule in a nap during my lunchbreak. For 15-20 minutes (I set a timer), I turn off and close my eyes (sometimes somewhere sunny, sometimes dark and cool). I often don't actually sleep, but by having the break away from everything and closing my eyes, it makes all the difference and I'm rearing and ready to go. Before I started doing this, I found myself lagging in the couple of hours after lunch and struggling to get anything done, but by taking just 15 minutes for a nap, I'm back to being productive in no time. Although I'm much more productive after a nap, my afternoons are nowhere near as productive as my mornings, so this is when I schedule in my less though-intensive work. This may be doing some internal development (I try and schedule in a couple of hours each week to stay on top of it), writing more blog posts (there's not usually enough time for them during my admin hour), doing research, presales or quotes and on Friday I spend my afternoon doing online courses and personal development. This is also a pretty flexible time so sometimes I just don't work then, and unless I've got a big project or a deadline that means I need to be working then, I let myself enjoy just taking an afternoon off. As I work from home, I need to make sure I'm still getting out and talking to people (so I don't become a hermit), and I'm really lucky in that my other job literally requires this. I work as an evangelist for a conference and so I'm required to go out to events and network with people in the community. The combination of the two jobs (solo and really social) works really well for me as I don't mind being alone most of the day and I have the energy to network and talk all evening. This isn't every night so my evenings are flexible as well and I either spend it at a meetup or with friends, spending a bit more time on my work, eating dinner, or just doing my own thing. Having this flexible time is good because I can use it for what I need, and it even gives me a block of time that are outside of peak website traffic when I need to perform updates or work on my client's site and I'm not comfortable doing it during the day. Although I call this my screen free time, the TV is often on, but my computer stays in the office and I touch my phone as little as possible. This is time for me to wind down at the end of the day and take a break out for myself. Sometimes I just sit and watch TV, but I also have my coffee table set up with miniature painting so will often get some painting done while the TV is on. Technically I can also take some time out to read a book, but my house is pretty quiet so I like having the TV on as background noise. Somewhere between 9.30 and 10.30 each evening, the TV goes off and my phone gets put on charge and away completely. This is then when I make a cup of tea, grab my book and sit in bed to read for a bit. Sometimes it's just for 5 or 10 minutes, other times I'm almost done and it takes a bit longer, but this is my time to relax and wind down at the end of the day. Even when I get home late, I've been trying to do this and it's something I really look forward to doing now. I've also got my bedside lamp set up on a schedule so between 10.45 and 11pm it gradually dims and turns itself off to let me know i need to finish up and get to sleep soon (sometimes I override this because I'm almost finished the book though). I don't really have a set routine on the weekend as it depends what I've got on and also this is my time so I want to be able to relax. I try to get up at a reasonable time still over the weekend otherwise it makes it harder when the week starts back, but I have 3 hours set aside for breakfast both days so I can laze in bed a bit, get up and make brekky and then enjoy a cup of coffee somewhere nice and warm. I try and book in the things I need to get done (eg. Saturday I have time set aside to do the garden, housework and get some washing done and Sunday I spend time doing some budgeting and also planning the week ahead), but these times are pretty flexible (and some tasks are weather dependent so it's a bit tough to get them done during winter). I also have scheduled in time on a Saturday which is available for me to get work done (if it's needed). This often doesn't get used, but it's good to have when there's a lot going on. While I've tried to put this in place several times during the last 12 months, it eventually got done properly after I attended a business retreat with Ming Johanson. I sat down with a weekly schedule (like this) and started blocking out the different sections of my day. I colour coded the sections so I can see what I'm doing when, and in particular I can see I've got enough purple time (that's me time 😄). This made it really easy for me to visualise what was happening when and see how my days were being spent. 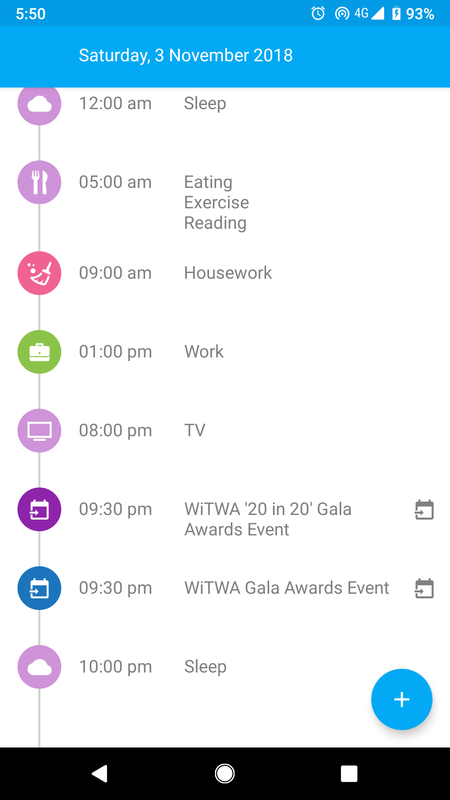 Once I had the schedule worked out, I was able to transition it into my scheduling app (different from my calendar). I use TimeTune (available for Android) but there a bunch of different apps out there that do similar things. This allowed me to put in my time blocks for each day, and allows you to program which routines are active when (for example, when I'm on holidays or at a conference the whole thing goes out the window). I have a reminder go off at the start of each new time block, and it gives me a reminder 15 minutes before I should be heading to bed. It even connects with my calendar, so I can see a timeline of where certain meetings and events are falling in my schedule. Having it in this format is also really useful when it comes to seeing how much time I'm spending on various tasks, as they will give you stats for each routine on how much time you're spending on each block classification (they use tags). This means it's really easy to see you're spending 60 hours each week on blocks tagged with work but only 5 hours tagged with me time, and helps you spot the parts that need changing. As I said at the start, the great thing about a good routine is it's not set in stone, it flexes and flows as needed. When I'm away at a conference, the whole thing basically goes out the window between flights, the conference schedule and any exploring or catching up I'm doing while I'm away. It also changes depending on what meetings and events I have on each week. Most of my meetups are in the evening, but some start a little earlier so I need to leave home a bit earlier, and some are in the morning (those ones were really hard in winter) which cuts into my morning work time. Part of my planning each Sunday involves going through the week ahead and seeing what I have on. Maybe I have a morning meetup, so I'm missing my big productive time. This may be ok, but it may mean I take my optional work block on a Saturday to make up for it. Your routine needs to be something that works for you, the chances that you also think starting work at 6am is slim-to-none, so don't feel like you have to do it because it seems "effective" or "productive" or because "all these successful people start their days early". Your most productive time may be at 1 in the morning, so see how you can make that part of your routine. Also don't let anyone make your feel bad for how you plan your routine. I spend a lot of time trying to defend the fact that I go to the beach at 10am every day, but the fact is by 10am I've done more work than I'd get done in 6 hours when I worked a 9-5. I'm not slacking off, I'm just working more efficiently. The funny thing is, I wrote this post completely out of my routine. I had schedule in to write this a couple of weeks ago, but the thing with my routine is things change, and as a proactive non-billable task this got pushed. So I finally got around to writing it, during an afternoon block of work when I wasn't really feeling super productive, sitting in the sun next to the river in Melbourne. Because my routine is about what works best for me. That means that I can take time off when I'm away to do something different, and means that I have things I can do when I'm not really feeling productive or am having difficulty concentrating.